2010 was quite an adventure! 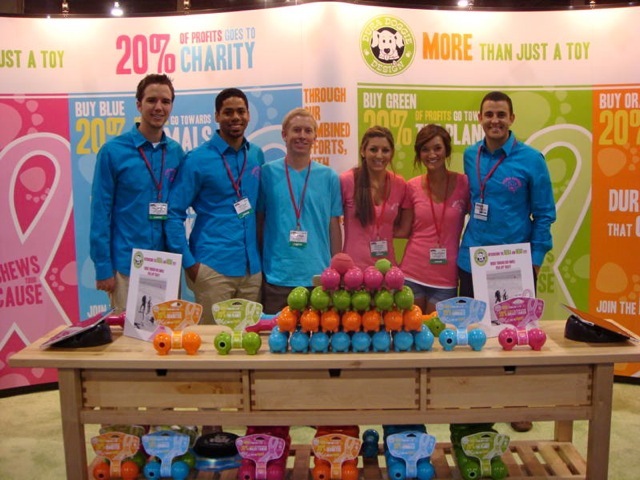 We were confident that our new pet toys would be a hit, but were totally blown away by the response at SuperZoo. We crushed our goals! 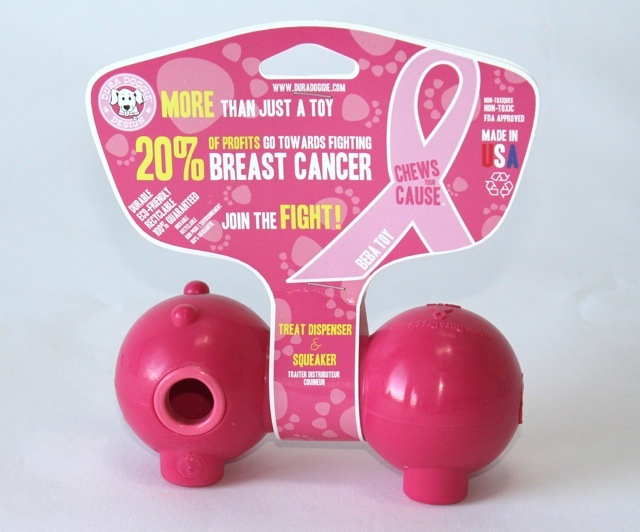 That’s where we launched our “Chews Your Cause” campaign, starring the Beba Toy and Nebo Ball, designed by Raad. These and our future products are color coded to represent specific causes such as Breast Cancer, Diabetes, Animal Shelters, and the Planet. 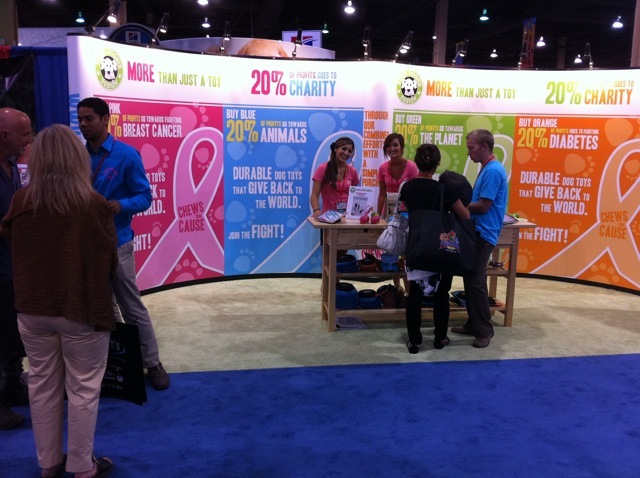 Twenty percent of our profits benefit the coordinating cause. We’re really excited because these new products are colorful, made in the USA, smell great, AND help raise money for charities. We’re also launching an amazing iPad app designed by Frank to assist sales reps with taking orders and capturing contacts. It can also integrate with QuickBooks and shipping companies to process orders in minutes rather than hours. 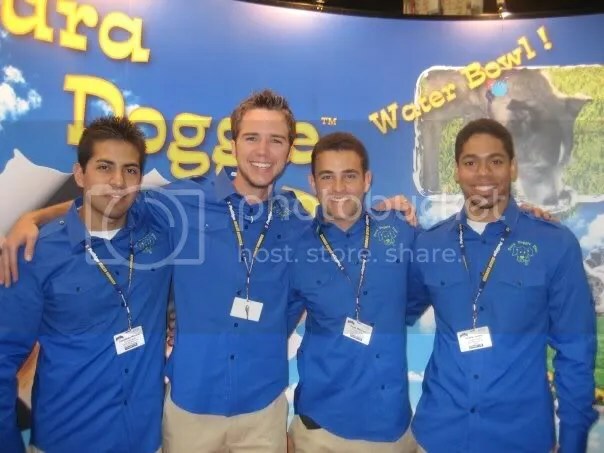 Pictured below is our crew at SuperZoo. Become a fan of “Chews Your Cause” and share our story with your Facebook friends. Pictured above is the Beba family: Chews Your Cause! The quarter was over and our entrepreneurialism course was gone forever. But, we had a great product; an actual physical object that we could take from our hands and place into potential consumer hands. But the question was would we want to take the risk? Did we want to spend all of our life savings to go further into this “thing” we call business? I mean all of us were smart kids with good GPA’s and even in the most turmoil of times, we still had jobs lined up…although we all knew that boredom would follow with those chosen careers paths. But was the risk worth it…to start from scratch. Personally, I like taking risks, but I like doing it in a way that includes great calculation. For instance, an average Joe goes to Vegas to play poker and relies solely on pure luck. He drinks his drink and attempts to conquer a game, having very little understanding of his cards and what they mean; he has no real sense of combination or statistics and most of time, that person is going to end up both broke and drunk (sorry if I offend anyone). But if that same guy read up on his poker and practiced with friends or on the computer before he attempted his methods, he would have a much better chance of winning. So we decided we would test the waters before we would jump full on into the dangerous river. 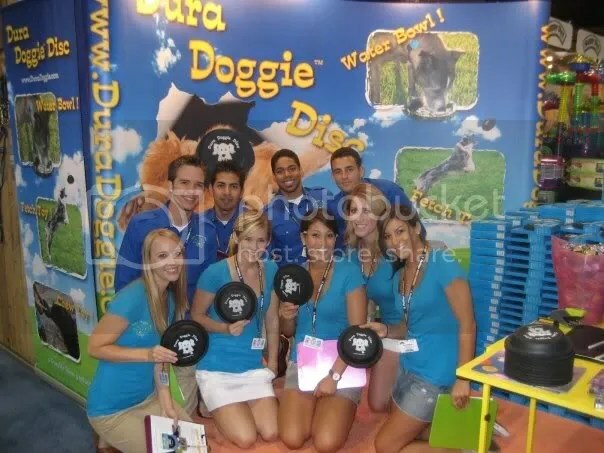 During my spring break of my senior year, I decided to ditch the Mexico trip filled with booze, girls, and possibly some of the most memorable times in my life… and headed to San Diego, California to make an attempt at selling the Dura Doggie Disc. We had not even produced packaging at this point and it was a long shot, but in the long term end of things, it seemed well worth it. For instance, if I failed, at least I got to practice my sales skills by cold calling stores and if I succeeded, then we had a business to start and grow. I drove the four hours south that I needed to and finally landed in the downtown area of San Diego where my older brother lives. The skyscrapers were all new, the weather was sunny and perfectly warm, and there were dogs of all sizes and breeds everywhere you looked. I had thought to myself, no wonder San Diego was voted as one of the friendliest dog cities around. It truly was amazing and I was excited and scared all at the same time. The next morning, I woke up from my brother’s comfortable couch, shaved, showered, brushed my teeth, grabbed a quick bite to eat, and headed out the door. The previous night, I had made a list of stores by searching for “pet stores in San Diego, Ca” on Google maps and inputting them into an excel spread sheet. At the time, I did not have a GPS device so I would input the directions from one store to the next into a column next to the store name on my sheet…it was so inefficient (I recommend buying the GPS device and saving yourself a lot of time). If I’d get lost, then the whole day would be ruined. Luckily, I stayed the course and made it to about ten stores that day. When I arrived at the first store that I was going to pitch to, I almost didn’t do it. I was thinking, “What am I doing right now?” As I mentioned before, we didn’t even have packaging, and I had never done this before, and I could almost guarantee that this store never heard about us before either…but I finally realized that it didn’t matter and did it anyways. I walked into a great store called “Dexter’s Deli” in Del Mar and it was crowded. Situated very close to the beach, this store was clean, organized, and had a great style to it. I waited till the crowd drifted out the store and approached a lovely lady named “Paige.” She asked me what she could do for me and I went into my little speech about how we started and what our product is…she order some on the spot. I couldn’t believe it. I really couldn’t. I was filled with joy and more importantly, a sense of relief. After I gave her the discs, I headed to the next spot and boom, once again they ordered on the spot. I headed to another store and although they didn’t order right then and there, they eventually placed an order. Keep in mind that not every store I went to really appreciated our story and our product…I definitely got the cold shoulder at some places and it’s just the way of the game. But my high from the initial stores was still going strong. Over the next five days, I got almost twenty stores to carry our product and they continue to re-order to this day. What seemed like a risk was nothing but a mere bump in our rode to success. It takes courage, and a little bit of fear to be successful. I say fear because fear is what keeps you in check and allows you to reason whether something is feasible or not. Had we not done that test and just rushed into business with no fear, we could have lost a lot of hard earned money had our product been a fluke. But instead, we tiptoed in a little before we fully devoted our time, energy, and resources…we took a very calculated risk. The picture that we visualize when thinking about college is academia, social interaction, and the true beginning stages of individualism….along with the parties, the drinking, and in our case (go UCSB!!) the beach. College was probably the best years of my life because I learned how to be myself and figure out what “I” really wanted out of life. There were no pressures or influences anymore to be something I did not want to be…there were no parents trying to push me to be a doctor, no teachers on personal level, and definitely no friends (they were too busy having fun) trying to persuade me to follow a certain career or life path. It was just me. Following my planned career path of mechanical engineering, I was on track to graduate with a pretty good GPA and the intention to snag a high paying job at an engineering company of some sort. Things were looking good and who knows, I could have had a comfortable life making a beginning salary of $60 grand doing the 8 to 5 job…but I was not really that happy. I am the kind of guy that looks out into the blue and warm sky (I live in Santa Barbara…) and ponders on the true reasoning for all of this: the world, our life’s, and what we should do? Although I can’t answer these questions in full, I do know one thing…sitting inside a colorless cubicle doing a plethora of work when the weather outside is so wonderful seem horrible to me. I knew that about after six months of work at a place just described, I would lose all interest and eventually be miserable at my high paying job. It wouldn’t be fair to my employer and it wouldn’t be fair to me. Then one day, I enrolled into an entrepreneurship course after much suggestion from my brother and my life forever changed. I felt excited again, I felt like this was my calling, and I felt that I could create and not necessarily just follow as I was intended. This class opened my eyes to what it takes to be an entrepreneur: hard-working, fearful but fearless, likes to think outside the box, understands the risks, likes to take nothing and make something out that, and much more. This was me. This was my definition if my name was in the dictionary. This course in a way was a philosophical moment for me because I always had the entrepreneurial spirit, but did not know of its existence (the same argument of how do we know something if we have never experienced it or been educated on the matter…is it innate or not). Now I instantly became happy with my life because I knew there was more to life than that feared cubicle job…I mean I always knew that in sometime I would have the job that comes with the perks and corner office, but I didn’t want that over time…I wanted that now. So instead of waiting, I decided at that point that I was going to create and make that for myself instead of following and waiting. I knew that this task would be difficult and it has proven to be so, but I have been so happy while in the process. The first day of this class came along and I learned more in two hours than I had ever done before…amazing is all that I can say. By the end, our professor announced that we would be researching some sort of problem in any industry of our choice and that we were to come up with a product that was a solution to that problem. At the end of the quarter, we were to present this product as if we were presenting to investors. 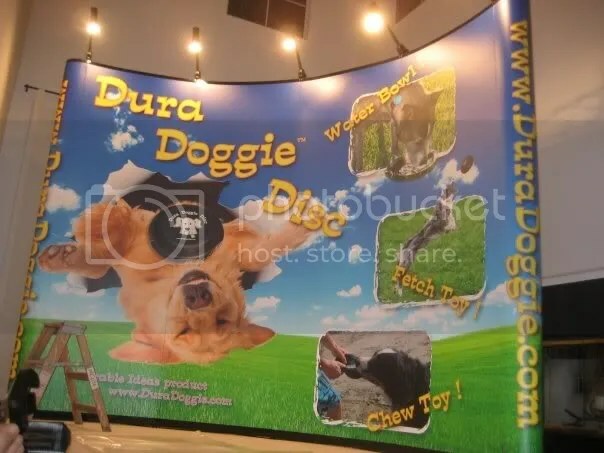 Luckily I choose the simplest product in the industry that is the most fun…the pet industry and thus was born Dura Doggie. Hello from everyone at Durable Ideas! We were given a great opportunity and we thank the people at ABC for making this happen. It was very brief but we were reviewed along with some really high tech and medically advanced pet products. 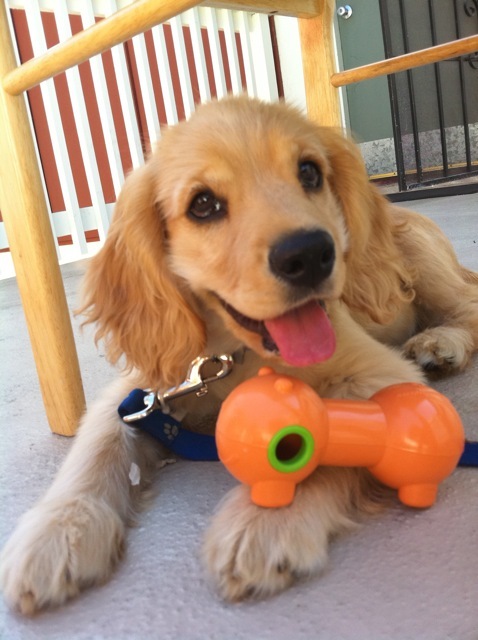 It shows that the Dura Doggie Disc has significant value out in the pet toy market today. Hope everyone has been well and Feliz Ano Nuevo aka Happy New Year! Why the last one? Because we we’re inside the Mandalay Bay Convention Center or our hotel the entire time! Yes, it was that exhausting. We did have an unforgettable dinner however, courtesy of our newest DI member, Frank! (Frank, I bet you remember every detail on that enormous bill you paid lol). Below are pictures of our booth even though they don’t do it much justice. We did this every day of the show, Dura Doggie Disc on three!! We received great feedback at the show, made some good sales but its been weeks, season has changed and we’re adapting. Launching a new marketing campaign for Fall and Winter, info to come later!